Oskia Renaissance Cleansing Gel: I love this cleanser and have probably used 4/5 bottles of it at this stage. I tend to use it as my morning cleanse and I love how soft my skin feels and how bright it looks when I use this. It is a balmy-gel texture that melts onto the skin and cleanses but doesn't strip. I have raved about this on many occasions and will again in the future. I haven't yet repurchased because I have 7 cleansers at the moment but I will definitely repurchase in the future! For Irish readers, I find Beauty Bay has the best prices on Oskia products. Pixi Glow Tonic: I absolutely adore this acid toner & this must be my 7th/8th bottle! This brightens and exfoliates my skin, refines my pores, makes my skin glow and is basically an all round winner, in my opinion! This is a non-negotiable in my skincare routine and I have already repurchased. Alpha H Liquid Gold: Another non-negotiable! I have used this for around 3/4 years now and I love it. I have raved about this so many times on here but basically, if you want a product that will give visible results overnight then this is the products for you! The morning after applying this, my skin looks clear, more even, refined and fresh. The glycolic acid content really helps to fade scarring and prevent further breakouts, especially along the jawline. I have already repurchased. Emma Hardie Moringa Cleansing Balm: Another highly repurchased product. I adore this cleansing balm - the texture is not too oily but not too stiff that it takes a large amount of elbow grease to work into the skin! It makes cleansing a very therapeutic and enjoyable experience and leaves the skin very clean (but not stripped or tight-feeling), nourished and plump. There is nothing not to love about this product and I know that it will be forever repurchased! Sarah Chapman Skinesis Intense Hydrating Booster: This is my favourite Sarah Chapman product. It really delivers an instant, powerful dose of hydration that lasts. My skin instantly feels more comfortable and hydrated and looks plump. It has an oily/watery texture and the pipette means that I can control how much I dispense. If you have dehydrated skin, I urge you to try this product and check out QVC for a fantastic offer on a duo of the booster (not sponsored, I just always like to share where I can get good offers!). I have already repurchased. Algenist Genius Ultimate Anti-Aging Cream: I really like this moisturiser, although it has quite a strange texture - almost like a cream/gel hybrid and I was initially unsure if it would be moisturising enough for my skin. I need not have worried because it is actually very rich and nourishing but not greasy. It is pretty expensive at £85 per 60ml pot (this is a 30ml pot) so I have not yet repurchased as I am currently using a different moisturiser that I love - more details on that coming in a post soon! Sephora Triple Action Cleansing Water: I picked this mini up when I was in Orlando in June and to be perfectly frank, it is nothing special - but then, what Micellar Water is? I found that although it is quite gentle, I had to go over my eyes a few times to remove every trace of makeup so it would sometimes leave my eyes quite sore as I prefer a one sweep eye makeup remover! I wouldn't repurchase. Nars Sheer Glow: This is my second bottle of Sheer Glow and for a foundation junkie, a repurchase is a big deal! Although this is neither sheer nor glowy, as the name would suggest, I love this foundation. It doesn't feel heavy on the face, yet delivers medium coverage (can be built to full by layering) and is pretty long-lasting. I always use a hydrating primer under this because it does have a tendency to cling to dry patches if the skin isn't adequately prepped but the little bit of extra effort is worth it for the flawless result this foundation gives. I currently own 13 foundations so I won't repurchase at the moment but definitely will soon because I love this reliable base product. Nars Radiant Creamy Concealer: Another repurchased product - this is my 3rd or 4th tube of this concealer. Despite its name, this concealer isn't so creamy that it will crease in the under eye area, which I love. It is also perfect for covering blemishes or areas of hyperpigmentation without being cakey. It is lightweight, yet packs a punch in terms of coverage and is an all round winner. Like Sheer Glow, it is a product that I know I will repurchase but not right now because I have 5 concealers on the go and I'm trying to be a bit better with my spending! Urban Decay Brow Beater: This is a really good alternative to the Anastasia Beverly Hills Brow Wiz, well actually what makes it better for those of us who don't live in the U.S. is that we can choose the perfect shade by swatching in Debenhams stores. It has a very fine nib, which is perfect for faking tiny brow hairs without looking unnatural and a spoolie on the other end, which is a must. I have two other brow products on the go at the moment, but will repurchase at some point. Lancaster Tan Maximiser Soothing & Repairing After Sun Maximiser: This is, without doubt, the very best aftersun that I have ever used. Although it is more expensive than other aftersuns, it is totally worth it if you want moisturised skin that maintains its tan. Three weeks after returning from holiday, people were still asking me if I had just come back from holiday because my tan looked so fresh. It is light in texture but really hydrating - my skin really doesn't feel any ill-effects from the sun/pool/sea when I use this and it maintains my tan like no other product ever has. I would say that it prolongs my tan for a month more than other aftersuns. I have used this on and after every holiday for the last couple of years and it is now in the forever repurchased category. Nuxe Prodigieux Shower Oil: I received this mini in a beauty box over the summer but only recently used it. I absolutely loved the musky scent of this product, which enveloped the whole bathroom and made having a bath or shower feel like a real treat. I tend to use budget body washes but if I ever feel like treating myself without getting too spendy, then I will buy a full size bottle of this product. Lanolips Lemonaid Lip Treatment: Another repurchased product (I told you that I finished lots of my favourite products!). This is, without doubt, the best lip balm that I have ever used! Last winter, my lips were so chapped that it was too painful to smile because that made my lips crack even further. I tried all of my usual lip products but nothing worked (including the Bite Beauty Agave Lip Mask), until I tried this product. This is not just a lip balm because it exfoliates too and it keeps my lips soft and smooth. If you suffer from dry lips then I urge you to try this product! I have already repurchased. Beautyblender: My beautyblender has seen better days! I adore this product and no other beauty sponge compares, in my opinion. It takes a little longer to do my makeup when I use this but the result makes the extra time worth it. My foundation always looks more flawless, yet natural, in a way that no brush can achieve. I will definitely repurchase. 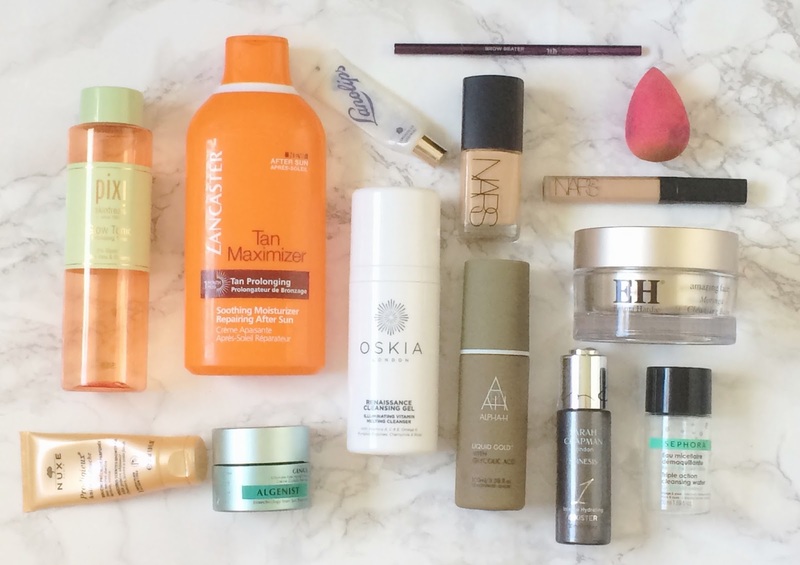 Like I said at the start, so many of these empties are favourite products! I would love to hear your thoughts on them! What products have you finished recently? Are you committed to finishing products before buying new ones or do you move on to others before finishing already opened products? I would love to hear in the comments below!